You probably didn't know this, but before I decided to dedicate all of my creativity to writing, I fancied myself an artist. I was never much good at it, but occasionally I would have flashes of brilliant luck where something would turn out sort of art-like. Like this exotic wood mobile I once made and could never replicate. But mostly what I ended up with was a giant mess of an art space full of paint splatters, saw dust, and mod podge everywhere. You see, art is just like writing. To break the rules, one must know the rules. I know the writing rules, but the art rules? Eh, not so much. However, I'm learning. For our anniversary, my husband and I decided to take a painting class through our local Painting With a Twist. Have you heard of this? It's fun! You supply your own snacks and drinks (booze is allowed! ), and they supply the art supplies and instructions. Our class also supplied two hours of eighties music, which led to a lot of impromptu singing and dancing, even though most of the one singing and dancing probably hadn't been born when the songs were popular. I'm officially old because my childhood is cool again. 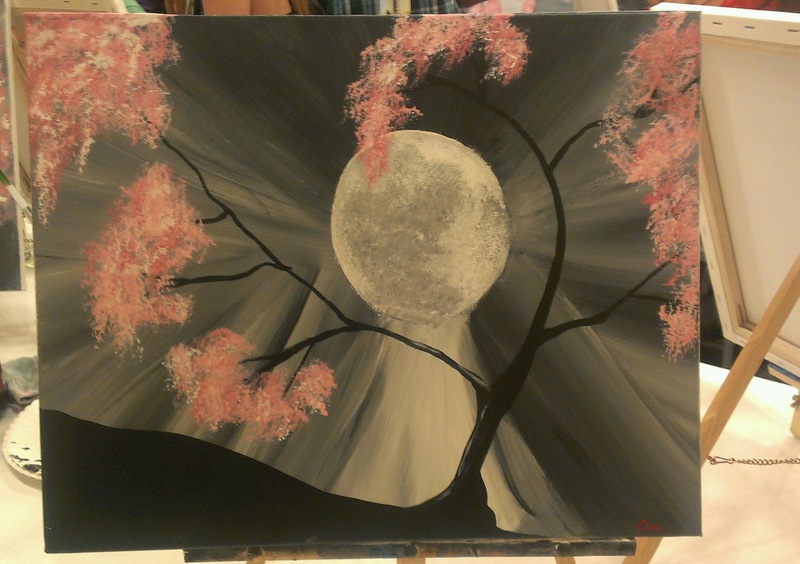 Our class was painting a tree in the moonlight. I tried to find a picture of what it was supposed to look like, but it isn't on their site anymore. First, we painted the sky and then we added a moon. Now, here is where I ran into my first problem. 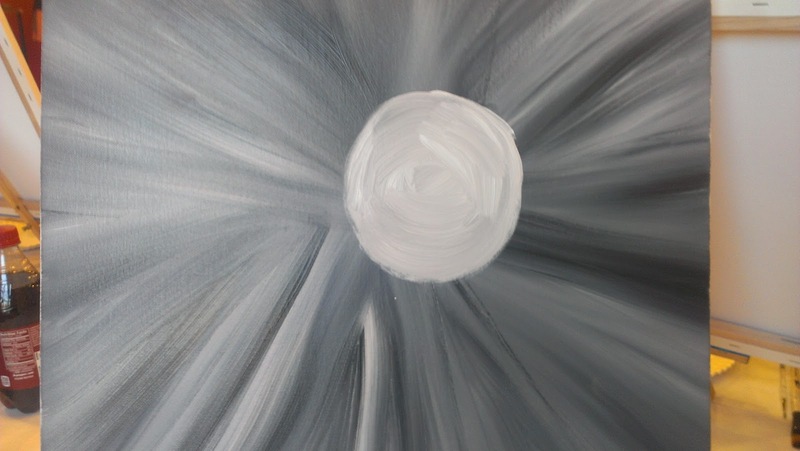 The original painting had this cloudy, ethereal look and I assumed that there would be a blending phase where we add some softening. No. That phase never happened, so my sky remained streaky. If you have a similar studio in your area, I highly recommend taking it. Date night, girl's night, guy's night, whatever, just go, bring your drinks (we did Starbucks because, as I mentioned above, I'm old) and have fun! We will definitely be taking another class. When we do, I'll post the results so that we can see if I've improved at all. Who knows? I may have it in me to be an artist yet. The imagery is very good. I once fancied myself an artist, and did oils and acryllics, but your art is definitely freer and more creative than mine. I realized fairly soon that my art, while not too bad technically, was too constrained and lacked the imagery that yours shows. You should keep it up. Do you have any of your paintings posted anywhere? I think you'll see what I mean. Those are really good! I love the lighthouse. Thanks! But I'm under no delusions. And when my walls filled up with my own paintings, I stopped. Here's a tip: if you do landscapes, lighthouses and covered bridges sell. I don't have a single covered bridge left, and I could probably sell that lighthouse if I tried real hard. Oops, did something wrong when I posted that comment. No picture, and it posted in the wrong place. Aren't computers wonderful? I actually like the streaks on the first one a lot. I wouldn't change that! I would totally put any of these on my wall. 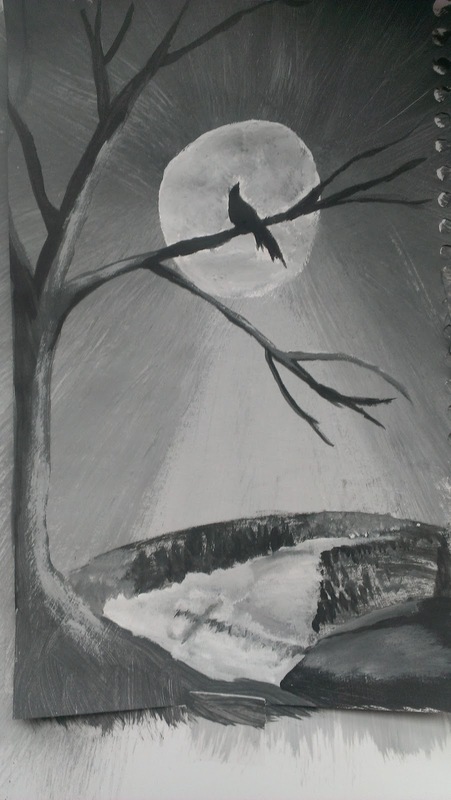 About drinking: I have found that if I drink any alcohol at all, my paintings turn out terrible. On the other hand, I can write drunk, as long as, like Hemingway, I edit sober. And that's my two cents. Sorry, you got modded. I set a filter to catch comments after a week so I don't end up with a bunch of Viagra spam on old posts.